Tabbouleh salad or tabouli is so light, lemony, minty, delicious and refreshing. Here I show you how you can serve it as delightful bite sized appetizers! Lots of tips and variations too. 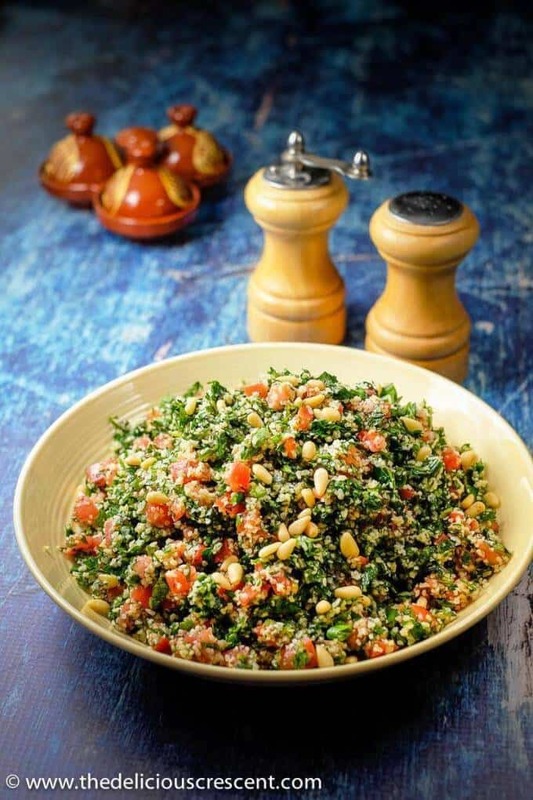 WHAT IS TABBOULEH OR TABOULI SALAD? Tabouli, tabbouleh, tabbuleh or tabouleh is a vegetarian salad of the eastern Mediterranean region. It is a salad made with lots of finely chopped fresh parsley, tomatoes, mint, green onions, bulgur, tossed with olive oil and lemon juice. This is a popular salad in the Levantine region. Often referred to as being of Lebanese origin but I have tried several variations of it in the homes of people who come from that area. Interestingly, there is a Turkish variation that uses more bulgur, is more red in color due to some tomato paste added to it. Personally I enjoy all the variations which fit with different moods and palates. Absolutely! I could eat more of it and not feel so guilty as it is light but so full of good nutrition. It has the antioxidant and flavonoid rich parsley, the fiber in bulgur wheat, the polyphenols of olive oil, the lycopene in tomatoes and plenty of phytochemicals. All of these nutrients together can be cancer protective, immune boosting and promote good health. Add the finishing touch with some crunchy and buttery pine nuts, that are a rich source of the heart healthy monounsaturated fats. Some studies have shown that the pinolenic acid in pine nuts help with suppressing hunger and aiding in weight loss. Use vegetables that are fresh, flavorful and crisp. The taste of this salad is in the choice of vegetables and how you chop it up. Choose firm but ripe tomatoes that are not too juicy. Drain the juices from the chopped vegetables. Put the rinsed herbs through a salad spinner for a dry feel. You absolutely don’t want a soggy tabouli salad. Use high quality extra virgin olive oil. It is best to use fine bulgur, preferably the dark variety ((burghul, boulghur, bulghur). You don’t need to soak it. Just rinse and let it drain. Fluff it up with a fork. If you use medium or extra coarse, use hot water and soak for half hour or more until the grains swell up well. For the ideal texture I do not recommend the use of food processor to chop your herbs. It may become mushy. The time it takes to chop up the herbs will be well worth it when you taste the nice texture of the salad. Chop all the vegetables finely using a sharp knife. 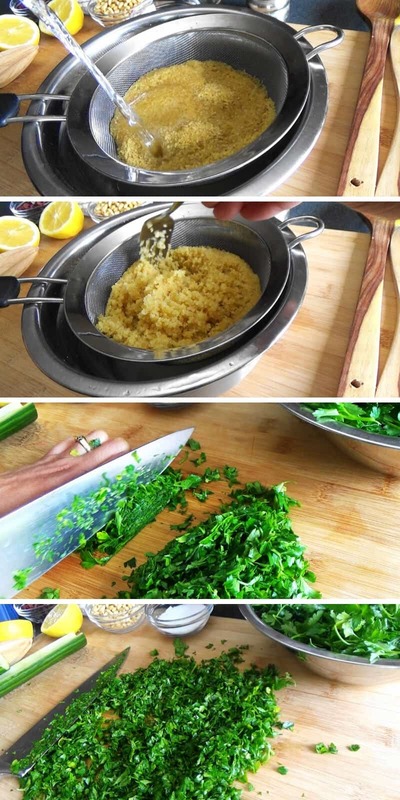 Grab a bunch of parsley and hold it down firmly without crushing it and chop finely. Pluck out the mint leaves and chop them right before adding it to the salad, as mint can darken quickly. 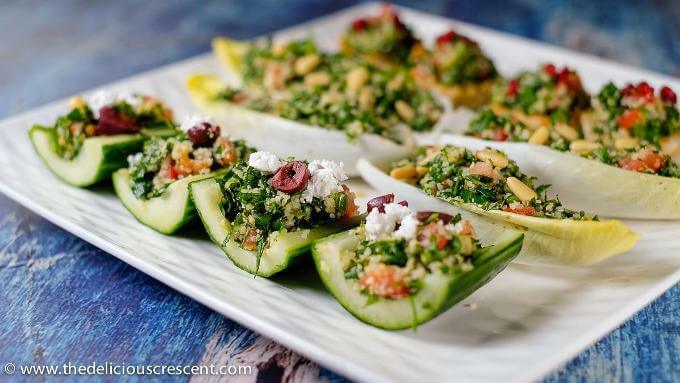 For the bite sized tabbouleh appetizers, you could also use hollowed out cucumbers. I like to use fresh and crisp organic English cucumbers for that. My favorite appetizer style version was the one with endive lettuce, followed by the filo cups. 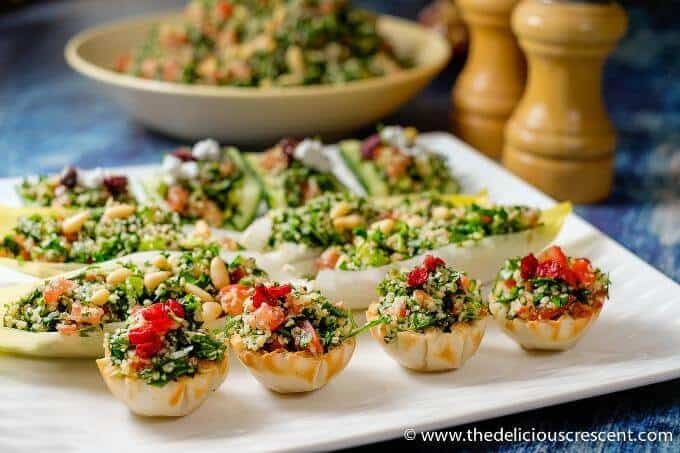 Can you make ahead tabouli salad? 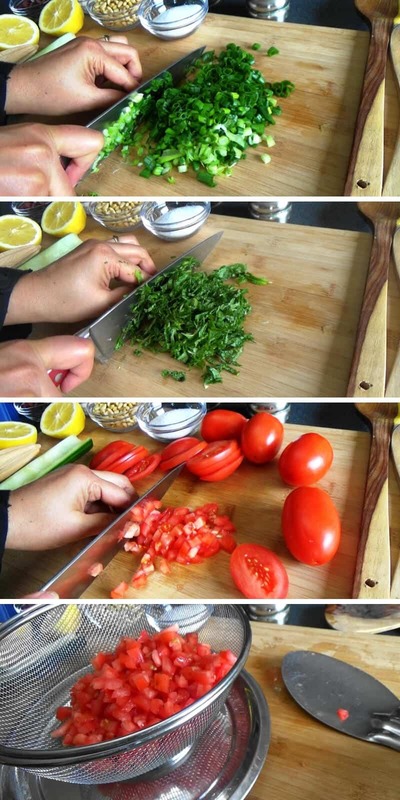 It is best to serve tabbouleh fresh on the same day. But you can do some make ahead steps. Chop the well drained parsley and green onions and store it loosely packed in a plastic bag or container. Use paper towels as a base if needed, to absorb the moisture. Finely chopped firm tomatoes can be placed in a sieve and stored in the refrigerator. Rinse or soak bulgur, drain and store in refrigerator. Gluten free: Use cooked quinoa, millet, amaranth or cauliflower rice instead of bulgur. Low carb and Grain free: Use cauliflower rice in place of bulgur. Check the instructions for making cauliflower rice. High Protein: Add some chickpeas, hemp seeds or other cooked beans. What kind of herb salads or salad based appetizers do you make? 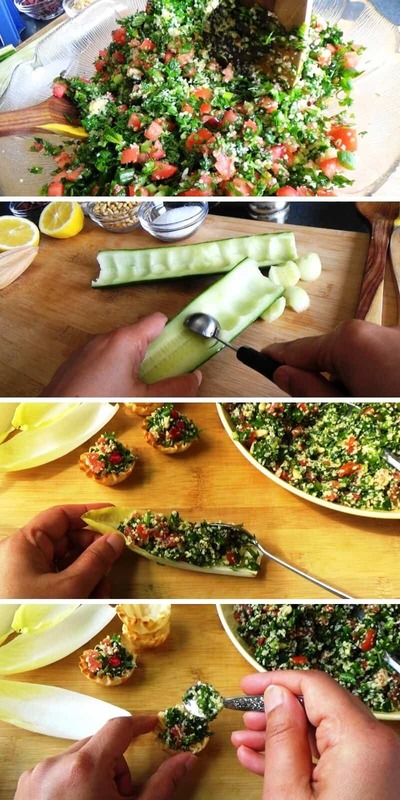 Did you try this “Tabbouleh Salad”? Do you have any questions about it? Or any suggestions? Let me know by leaving a comment below, rating it, and tagging it with a photo at #thedeliciouscrescent on Instagram. And if you liked this post, do share it with your friends! Tabbouleh salad or tabouli is so light, lemony, minty, delicious and refreshing. 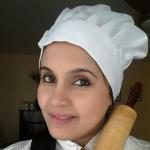 Here I show you how you can serve it in delightful bite sized appetizers! Rinse the fine bulgur wheat in cold water, drain and set it aside. Fluff it up with a fork from time to time. It is ready when it swells up well. Rinse the herbs and spin them in the salad spinner. Using a sharp knife chop the parsley, mint and green onions. Slice the tomatoes thinly. Stack two to three slices and chop them crosswise. Mix the lemon juice, olive oil, salt and pepper. Combine all the salad ingredients and mix well. Adjust seasoning to taste. Serve at once or refrigerate for 1 to 2 hours. This will enhance the taste and flavor even more. Toast the pine nuts in a toaster oven for about 5 minutes or less until golden brown. Sprinkle the pine nuts on the top. 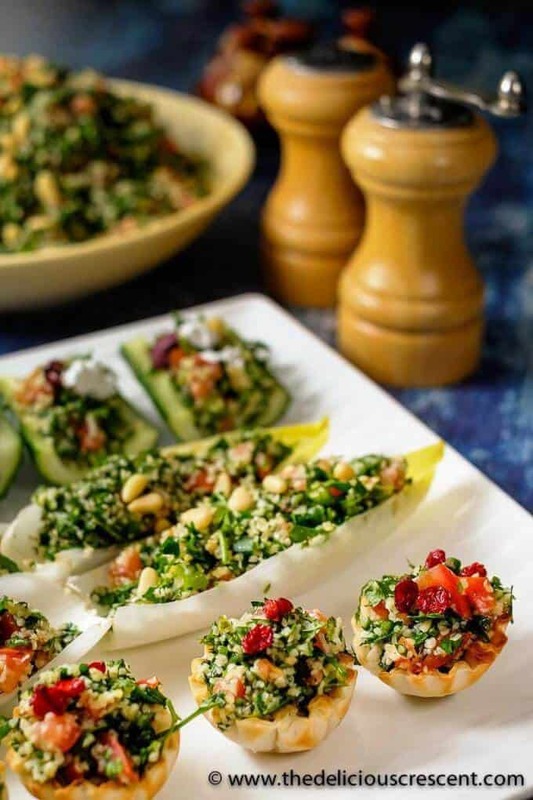 Scoop out the tabouli into endive lettuce leaves, baked and cooled fillo cups, tostitos scoops. The filo cups or tostitos scoops should be filled right before serving or they can become soggy. To make cucumber boats, cut the English cucumber lengthwise. Using a melon baller scoop out the center portion and cut the cucumber into smaller boats. Fill it with tabouli salad. Garnish with crumbled feta, chopped olives, toasted nuts, hemp seeds, cooked chickpeas, soaked barberries or pomegranate kernels. Never cooked with tabbouleh yet! But these sound like a great party appetizer idea! Nutritious and tasty. Thanks for this recipe. You must try the salad.